2016 marks the 30th anniversary of the Silver American Eagle coin series from the United States Mint. In celebration, the United States Mint has special plans for the proof and burnished versions of the coin, and the NGC is marking the occasion with a 30th anniversary label. Today, the 2016 Silver American Eagle coin is available on Silver.com with a near-perfect grade and celebratory label. 30th Anniversary of the Silver American Eagle coin. Ships with a 1st Day, 30th Anniversary Label from the NGC. Introduced in 1986, the Silver American Eagle is the official bullion coin of the United States. In 2016, the US Mint is celebrating 30 years of Silver American Eagle coin production. The coin enters 2016 on the back of record-breaking sales years in 2014 and 2015. Two years ago, the Silver American Eagle broke a record with 44.3 million coins sold, and surpassed that in 2015 with a mintage of 47.2 million coins in total. These sales totals were powered mostly by the popularity of the bullion coins, but also included mintage and sales figures for the proof and burnished versions. For the 30th anniversary celebration, the United States Mint will issue the proof and burnished versions of the coin with a smooth edge that includes lettering honoring the occasion. These bullion coins will not feature any edge lettering, which is a first in the history of the United States Mint. 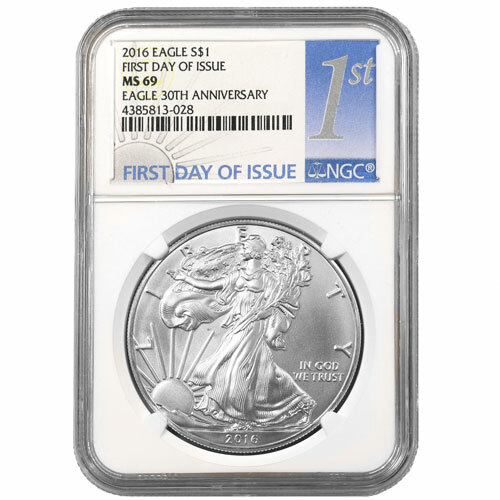 Each 2016 Silver American Eagle in this product listing is a near-perfect coin according to the NGC. Coins with an MS69 grade still have their full, original mint luster, but also feature a maximum of two minor detracting flaws. 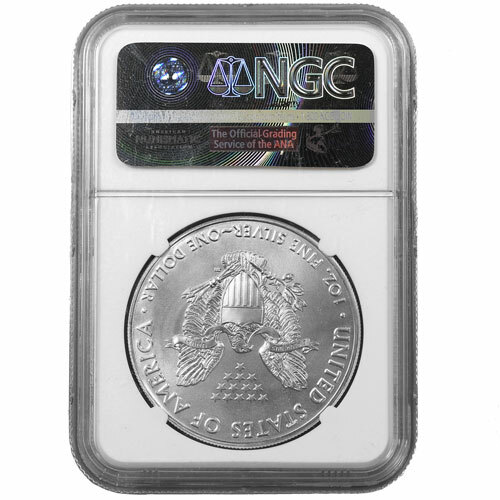 In honor of the coin’s 30th anniversary, the NGC issued 30th Anniversary labels inside the plastic slab the coins ship in. These are also First Day coins, indicating they were delivered to the NGC within 24 hours of the release date set by the US Mint. Please direct any questions you have to a Silver.com associate by calling us at 888-989-7223, connecting with us online via our live chat, or sending us an email.